Only the common waterbuck is found in Botswana and is predominately seen in the Chobe National Park and Linyanti Wildlife Reserve as well on the eastern side of the Okavango Delta. They are relatively uncommon elsewhere. The waterbuck was described by Earnest Hemingway as 'no more ruggedly handsome animal in all of Africa', and with its long forward-sweeping horns and large size, this description does not seem far off for most visitors to Africa. 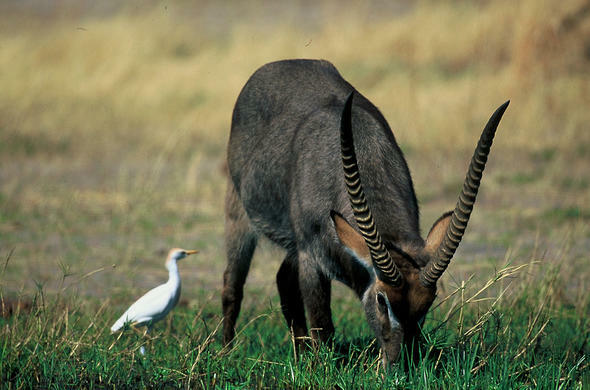 The waterbuck of Botswana is the common subspecies with the distinctive white ring on its rump. Many theories have been put forward as to why the waterbuck have this ring but all theories fall short when describing the defassa waterbuck which has a solid off-white rump. Despite their name waterbuck are not aquatic but they do prefer to live in the vicinity of permanent water bodies. They do, however, head into the water when danger threatens. There is a long-held theory that predators avoid waterbuck due to a secretion on the skin that gives the meat a bad taste, but this has not been proven. The skin does produce an oily secretion but whether it deters predators is debatable as lions do prey on waterbuck when the opportunity arises. The theory may stem from the waterbucks habit of running into the water for safety - whereupon most predators will then give up the chase - and as such the waterbuck are not hunted as often as other prey species. After birth the young are hidden for a couple of weeks, with the mother returning during the day to feed and clean the calf. The cleaning is to keep predator-attracting odours at bay.